KLRU is located at 2504-B Whitis Ave. on The University of Texas at Austin campus in the Jesse H. Jones Communication Center, Bldg. B (CMB). From Mopac (Loop 1): Exit on Windsor Road heading east (Windsor Road becomes 24th Street). Travel 1-1/2 miles on 24th Street (heading east) to Guadalupe. Turn Left onto Guadalupe. KLRU is on the corner of Guadalupe and 26th (Dean Keeton) Street. See parking options below. From IH35 Southbound: Take IH-35 Lower Level to 32nd Street/Dean Keeton Exit. Go east, get in far right lane and take cut-off onto Dean Keeton. 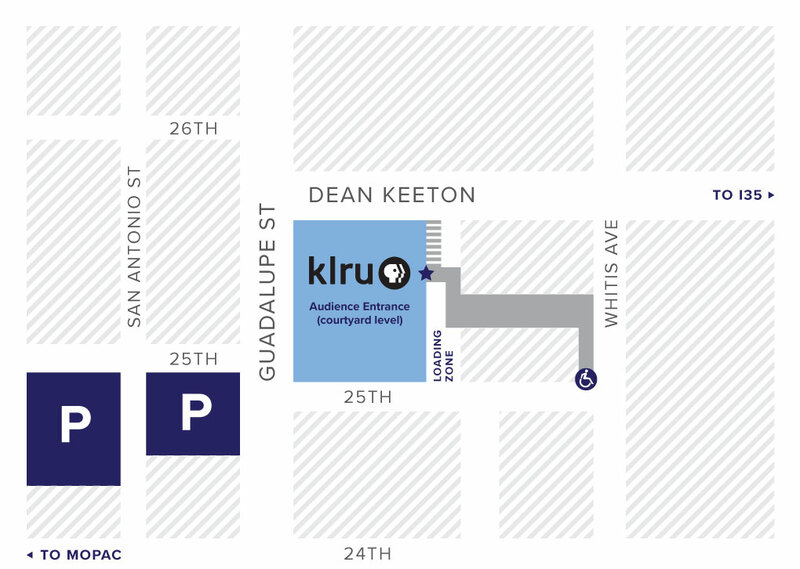 KLRU is on the corner of Guadalupe and 26th (Dean Keeton) Street. See parking options below. From IH35 Northbound: Take IH-35 Lower Level to Lyndon B. Johnson Library Exit. Go north on access road, get in far right lane and follow signs for LBJ Library onto Dean Keeton. Stay on Dean Keeton. KLRU is on the corner of Guadalupe and 26th (Dean Keeton) Street. See parking options below. KLRU is committed to compliance with the Americans with Disabilities Act. Please use the ramp at the corner of 25th and Whitis Avenue and cross the courtyard to KLRU for access to the building. A limited number of parking spots for individuals with Disabled Plates and Placards are available along Whitis Avenue. Contact us at 512-471-4811 to request assistance in advance. If you are looking for directions to an ACL taping, you can find them on the ACL-Live site, with parking options.